Hello! 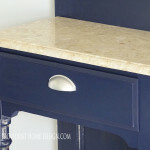 Today I want share an easy way to makeover an outdated dresser. 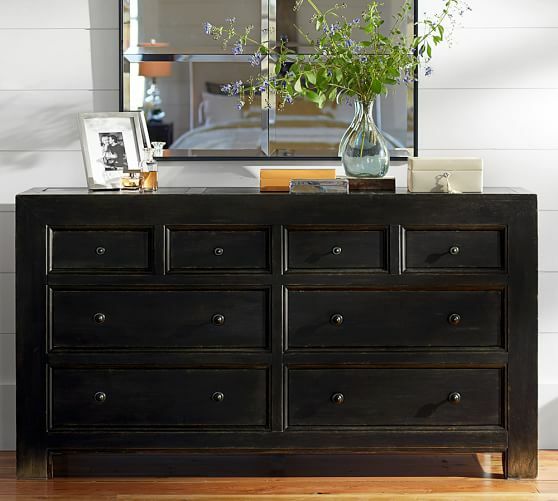 Distressed furniture continues to be a popular trend which is good for us because it makes re-doing a dresser even that much easier! 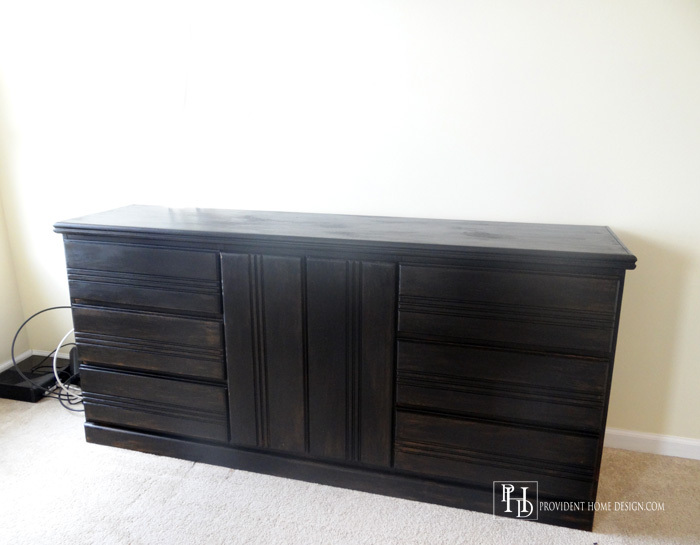 Here is the dresser that inspired this furniture makeover. And back to the dresser notice how a warm wood tone shows through on the legs of the dresser. 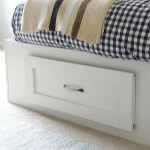 If you are able to look even closer you will see that wood peeks through slightly on the drawer fronts as well. 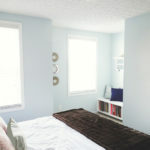 I have been helping my friend re-do her master bedroom. This past week we focused on the wall across from her bed that needed redecorating. 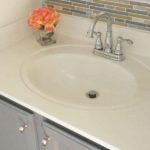 Although the piece of furniture she had was unique and pretty it wasn’t very functional for holding clothes and I felt a horizontal dresser would look better proportioned on that particular wall. 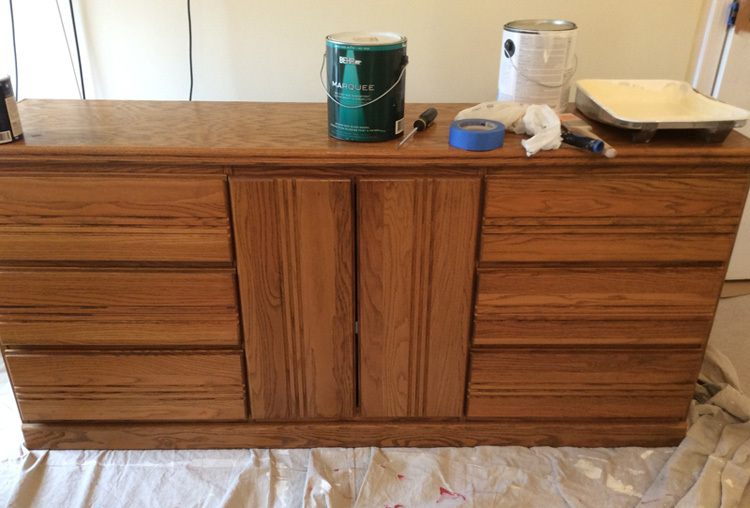 Lucky for us my friend had a long dresser in another room that she wasn’t using anymore. Since the furniture is black on the wall across from it I felt it would be important to balance the room out with another piece of furniture in black. My friend wants an elegant farmhouse vibe to the room so having some of the wood show through would be a definite nod to the farmhouse feel. It was a very simple process! 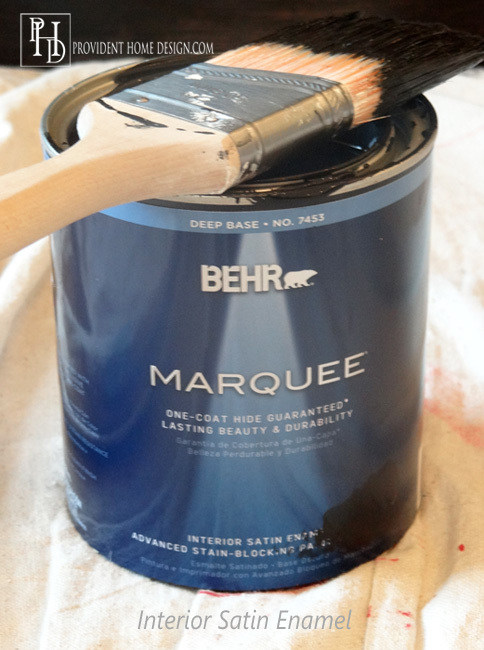 We got a quart of black enamel in a satin sheen for around $12. We cleaned the dresser with a wet rag but didn’t sand or prime it at all. 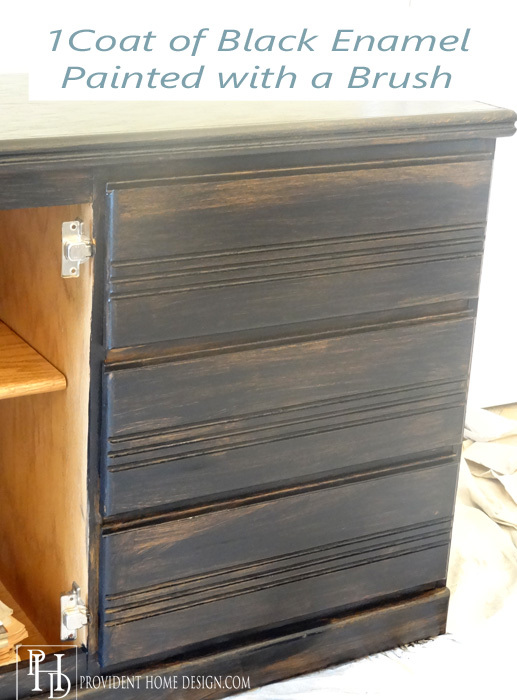 Then using a normal paint brush just brushed the black enamel paint on the whole dresser making sure to brush in the same direction as the wood grain. As you can see the paint didn’t go on very evenly but that’s actually a good thing. Last step, (yep last step already!) paint another coat onto the dresser but this time choose some of the areas with the wood tone peeking through to not cover. This is where you get to be a little artistic and make it your own! I am really happy with how it turned out and with the ease and quickness of the project! 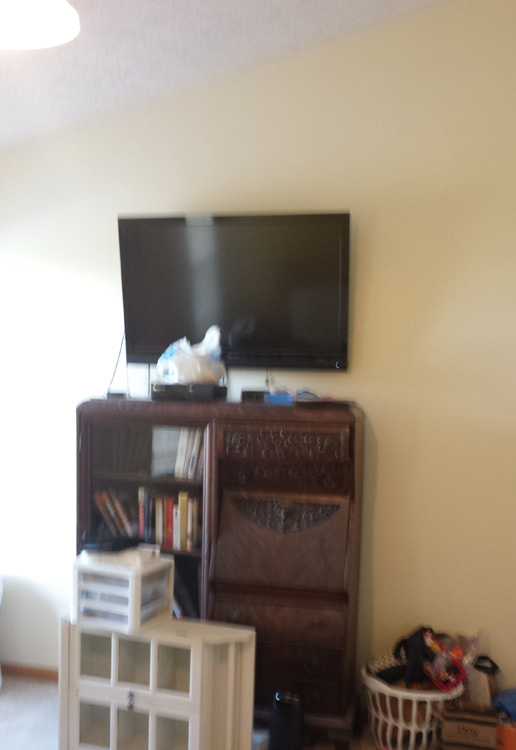 My friend and her husband will be placing their TV 6-8 inches above the dresser and then we plan to do a gallery wall around the TV. We’ve also been working on other parts of the room. Here is the before shot. And here is our progress so far. She spray painted the bases of her lamps chrome. 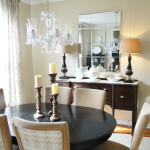 She also spray painted and rewired the chandelier which she bought at a garage sale for $5. 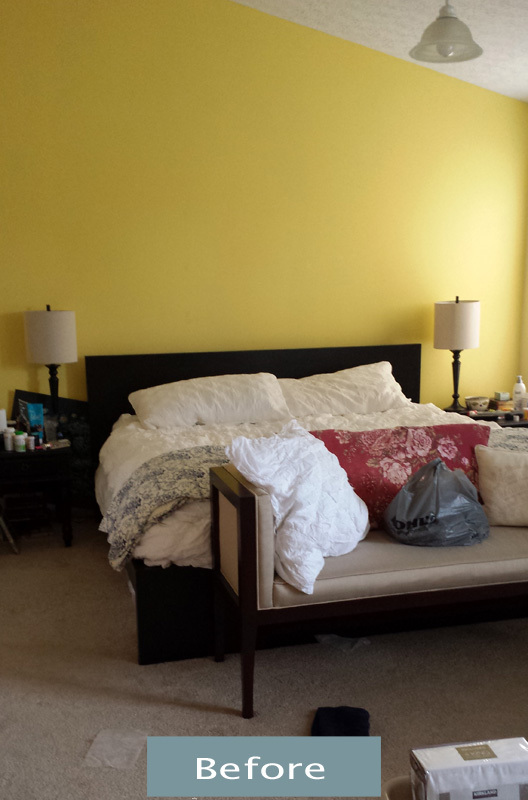 And painted the bright yellow accent wall in the Before photo to match the rest of the walls which boasts a creamy, soft yellow color. 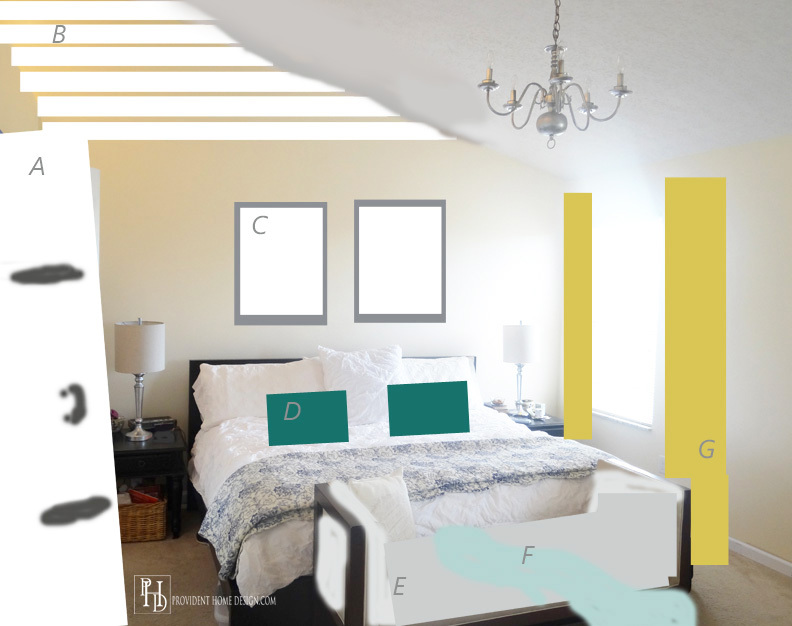 I threw together a mock up in photoshop (Warning: I’m a lazy photoshopper) of some of the ideas I have for the room in case you’re interested. There are letters that correspond to each presented design element. A. Is a poor depiction of a sliding barn door that will go over the doorway to her bathroom. B. 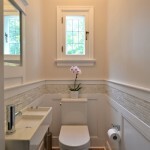 Is suppose to represent white shiplap wood trim running horizontally the top 1/4 of the wall. 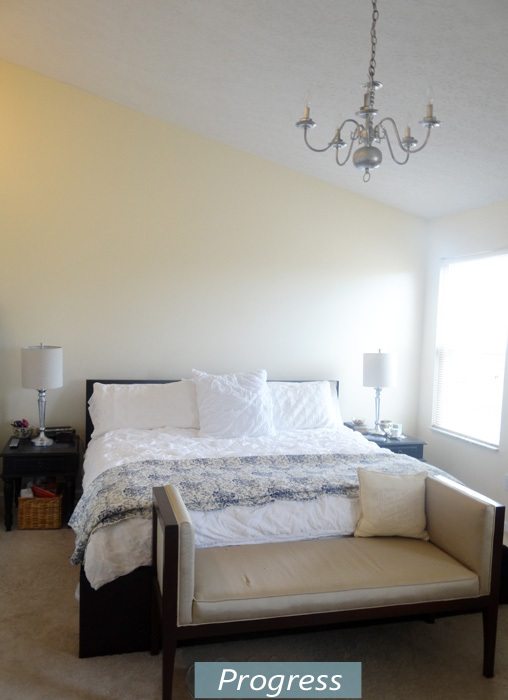 C. Represents two large matted prints above the bed. D. Represents a few more pillows on her bed to bring in more color and maybe pattern. E. Is to possibly paint or reupholster the bench in a light gray fabric. G. Long drapes is a must. I’m excited about the possibilities and we will of course being doing this of a tight budget which makes it all the more challenging and fun! What would you do to it if this was your space to tinker with? 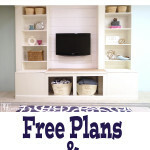 Let me know if you have any questions about the dresser!! Have a wonderful weekend! Hi Barbara, I will be happy to do a post on rewiring a lamp down the road. Thanks for the request! Great job! The color is perfect!